New Winemaker at Marcassin Winery Ryan O’Donnell joined Marcassin Winery as the new winemaker this spring. O’Donnell comes from Kosta Browne Winery where he was the associate winemaker, and before that, the associate winemaker at Paul Hobbs Winery. Staff Changes at Archery Summit M. Eleni Papadakis is the new assistant winemaker and Tim Scott is the new vineyard manager. Last year the winery, which is owned by Crimson Wine Group, hired Chris Mazepink as the new general manager and winemaker following the departure of long time winemaker Anna Matzinger. Papadakis was the winemaker at Domaine Serene from 2008 to 2011. Scott was formerly the vineyard manager for Domaine Drouhin Oregon and switched places with the former vineyard manager, Leigh Bartholomew, who is now the vineyard manager at Domaine Drouhin Oregon. 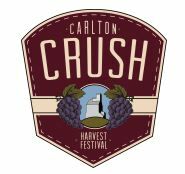 Carlton Crush The Carlton Business Association (CBA) has announced that the registration process is open for all competitions at the upcoming 2014 Carlton Crush Harvest Festival. Registration forms for the Grape Stomp, Barrel Rolling Race, and Wine Thief Relay competitions are all available on the event’s website at www.CarltonCrush.com. The Carlton Crush Harvest Festival will be held on Saturday, September 13, 2014, celebrating the unique culture of Carlton and Yamhill County. Live music and entertainment, a vintage Thunderbird Car Display, festival food and drink, midway games for kids, an Artist’s Market, helicopter rides, and exciting competitions. Top Ten Pinot Noirs The drinks business.com Global Pinot Noir Masters had 300 entries from 16 countries judged blind by an expert panel featuring eight Masters of Wine and one Master Sommelier. The results: (10) NV Champagne Soutiran Cuvée Perle Noire Grand Cru, (9) 2013 Viña Maycas del Limarí Pinot Noir Reserve (Chile who dominated the medals at the lower end of the Pinot price spectrum), (8) 2012 Hope Family Wines Liberty School Central Coast Pinot Noir, (7) 2011 Schug Carneros Estate Winery Pinot Noir, (6) 2010 Stoller Family Estate Reserve Dundee Hills Willamette Valley Pinot Noir, (5) 2010 Bomb Wines Willamette Valley Pinot Noir (unreleased), (4) 2012 Circe Vineyards Hillcrest Road Mornington Peninsula Victoria Australia, (3) 2011 Craggy Range Vineyards “Aroha” Te Muna Road Vineyard New Zealand Pinot Noir, (2) 2011 Jackson Family Wines Wild Ridge Sonoma Coast Pinot Noir, and (1) 2010 Viña Cono Sur Ocio Chile Pinot Noir. Leading German Pinot Noir Producer Dies Bernhard Huber was one of the first in Germany to stop selling wine to local cooperatives and produce wine instead under his own name. He also led the charge to plant Pinot Noir in Germany between 1980 and 2012. His estate was located in Malterdingen in Baden. Huber was often referred to as the godfather of German Pinot Noir and some of his single-vineyard Pinot Noirs equaled or surpassed famous grand crus from Burgundy. Corks Still the Preferred Closure Wine Business Monthly (June 2014) reported that natural corks remain the most common type of wine closure by a large margin. The number of wineries using natural corks have been about the same as 10 years ago, with 8 out of 10 wineries (78 percent) reporting that they use natural cork. Among Pinot Noir producers in California and Oregon, the overwhelming preference is for natural corks although there are a number of prominent producers committed to screwcaps. Santa Barbara County Viticulture Maps Santa Barbara Vintners announced the release of six new Santa Barbara County viticulture maps. The detailed maps outline the AVA borders and indicate where each vineyard is located. 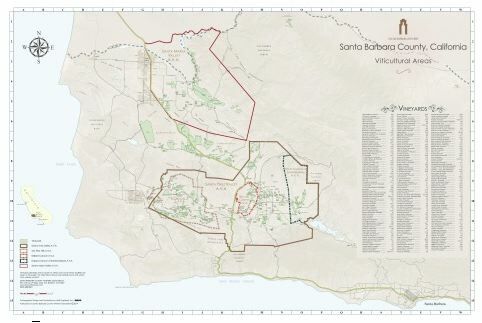 The Santa Barbara County map shows the county as a whole, while the more specialized AVA maps show the vineyards in more detail. Each map retails for $20 plus tax and shipping and handling. Discounts for trade and multiple map purchases. Visit www.sbccountywines.com to buy. Russian River Valley Winegrowers Look at Diversity in AVA Winemakers at the recent Russian River Valley Pinot Classic discussed splitting the appellation into “neighborhoods.” They chose to split the Russian River Valley into three neighborhoods for the discussion: the Middle Reach, Laguna Ridge and Green Valley. The Santa Rosa Plain and Sebastopol Hills are also being discussed. Today, the Russian River Valley AVA is huge at 169,029 total acres with about 16,000 acres planted to wine grapes. There is said to be more soil types than in Burgundy and there are marked climatic differences between the northern and southern neighborhoods, so it has hard to characterize the AVA as a whole. 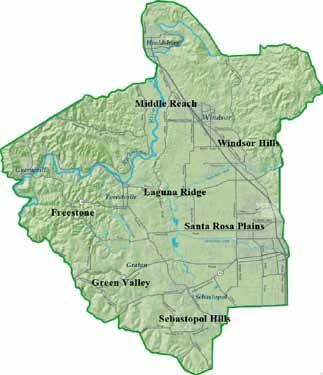 A special committee has been organized and led by Clay Gantz, a winegrower and member of the Russian River Valley Winegrowers Board, to attempt to define each neighborhood. 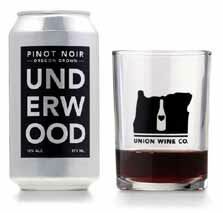 Underwood Oregon Pinot Noir & Pinot Gris in a Can Oregon wine producer Union Wine Company, owned by Ryan Harms, has launched Underwood Pinot Noir and Pinot Gris in 375-milliliter cans (two glasses or about a half bottle of wine) with a canned Rosé planed for early 2015. The wines are the first non carbonated wines to be bottled in a can. The exact wines are also available in bottles. The allure is that wine in cans is unpretentious (“pinkies down”) and practical as a can is very portable and readily disposable. They are lighter than bottles, easy to transport, unbreakable and reduce the environmental footprint because they are 100% recyclable. Apparently when the wine is poured into a glass, it tastes identical to the same wine poured from a bottle. Since the can is lined, there is no metallic flavor. A four-pack of Pinot Noir is $24.00. The 2013 Underwood Pinot Noir is sourced from the Umpqua Valley (60%) and the Willamette Valley (40%). Aged 6 months in 15% new French oak barrels with a finished alcohol of 13.0% and residual sugar of less than 0.2%. The 2013 wine was released in April 2013. There is distribution in many states and it can be bought online at www.unionwinecompany.com. Union Wine Company, operating out of Sherwood, Oregon, has a Tasting Truck which is used for events and will serve as a mobile tasting room in Portland. Union Wine Co. recently purchased historic Amity Vineyards. Scratchpad Sports Interactive Wine Label Terravant Wine Company in Buellton has released three wines from California’s Central Coast (2011 Pinot Noir - $15,, 2011 Chardonnay - $13, and 2012 Sauvignon Blanc - $11)) that have nearly blank labels that encourage drinkers to draw and write on the front label, take a photo, and share via social media including the Scratchpad Facebook page and Instagram. The Scratchpad wines come with a charcoal pencil hung on the neck that says, “Doodle, Post, Sip.” The wines are in wide distribution. Winemaker Chris Whitcraft Dies Years ago when I had a burgeoning interest in Pinot Noir, I became interested in Whitcraft’s quirky newsletters and his Pinot Noirs. He began the Whitcraft label in Santa Barbara in 1976 and was one of the first wineries within the city limits. Whitcraft started with sparkling wine and Chardonnay, unhappy with his early attempts at Pinot Noir because of the way grapes were grown at the time. He started making Pinot Noir in earnest in 1985. His wines were sometimes a bit off the beaten track but were always interesting. Legend has it that he lived in a camper during harvest behind the Hitching Post II restaurant and spent a number of evenings in the bar drinking wine with Frank Ostini. He talked to Rex Pickett, the author of ‘Sideways,’ on a number of occasions. He also was friends with Burt Williams of Williams Selyem fame and made wine from Williams’ Morning Dew Ranch in Anderson Valley. Whitcraft had his own daily radio show called “The Wine show” from 1978 to 1989. Most recently, his son Drake had assisted in the winemaking at the winery’s industrial building in downtown Santa Barbara. New Location for Soléna Estate The winery’s tasting room is now located 500 feet from the old one (it was sold to Kendall-Jackson) at 17096 NE Woodland Loop Road in Yamhill. ¡Salud! Has New Vision for Oregon Pinot Noir Auction. This year’s November 14-15 weekend auction will now be held entirely in the Willamette Valley due to a partnership with The Allison Inn & Spa in Newberg. The Allison is hosting the Saturday events and closing its doors to the general public so that only ¡Salud! guests can stay at the Inn November 14-15. There are a limited number of weekend packages for sale, which include two nights deluxe lodging, transportation and two tickets to the ¡Salud! Cuvée Tasting & Auction at Domaine Drouhin Oregon, and two tickets to the Dinner and Auction Gala, plus breakfast Saturday morning. The price of the weekend package starts at $1,500 a couple. Call The Allison Inn & Spa at 877-294-2525. Tickets to the ¡Salud! Friday and Saturday events are available online at www.tualityhealth.ejoinme.org/salud2014. ¡Salud! is a cause that I have supported for many years. It is a unique collaboration between Oregon winemakers and healthcare professionals to provide access to healthcare services for Oregon’s seasonal vineyard workers and their families. Hanzell Winemaker Icon Bob Sessions Dies at Age 82 There have been a number of tributes written about Bob Sessions who was revered winemaker at Hanzell Vineyards in Sonoma Valley for more than 41 years. He had succumbed to a long battle with Alzheimer’s disease. Warren Winiarski, the father of Stag’s Leap Wine Cellars, said, “I was a long time admirer of Bob’s wines and asked him many years ago during a job transition for him to join us at Stag’s Leap Wine Cellars. His presence and contributions at the winery were a model to judge whether we were accomplishing our goals for excellence.” He first assumed the role of Winemaker and General Manager of Hanzell Vineyards in 1973, and always took to heart the dreams and visions of its founder, Ambassador James D. Zellerbach, in producing wines that equalled the best in the world. He produced Chardonnays and Pinot Noirs that were equal to the greatest wines in the world. His wines could be cellared for decades on a path parallel with Grand Cru Burgundy. Very few winemakers in the world have left such an amazing legacy of quality and longevity. In 2002, Sessions retired and assumed the role of Winemaker Emeritus, passing on his knowledge and experience to the winemakers that followed, including current Winemaker Michael McNeill, only the fifth winemaker in the history of the estate. Artesa Abandons Vineyard Plans Near Annapolis As reported in The Press Democrat (June 3, 2014), Artesa Vineyards and Winery plans to sell their 324-acre property for $1.5 million after last year environmentalists persuaded a Sonoma County judge to rule that the vineyard’s environmental studies were flawed. Artesa claims it has refocused their growth strategy on the Napa Valley rather than the Sonoma Coast. 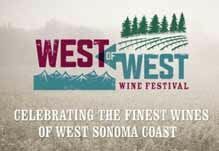 West of West Festival in Sebastopol The annual West of West Festival, sponsored by the West Sonoma Coast Vintners (WSCV) will be held at The Barlow in Sebastopol, California on August 1-3. The event kicks off with nine intimate winemaker dinners on August 1. On August 2, the morning Seminar will feature “The Evolution of California Cuisine and Wine,” and the afternoon Seminar will focus on “Charles Heintz Vineyard Chardonnay.” The Grand Tasting will follow on Saturday and then a dinner featuring the talent behind San Francisco’s three hottest restaurants (Statebird Provisions, Rich Table and Bar Tartine). The Grand Tasting will be repeated in the afternoon on August 3. Tickets and information are at www.westsonomacoast.com. 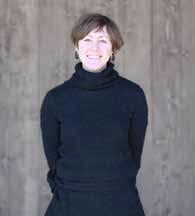 Erin Miller New Winemaker at Twomey Cellars The Duncan family announced the appointment of Erin Miller as Pinot Noir Winemaker for Twomey. She will report to longtime Silver Oak and Twomey Director of Winemaking Daniel Baron, but will be responsible for managing wine production from grape to bottle. Erin earned an MS from University of California at Davis. Most recently she was with Provingage Wine Associates, working for Evening Land Vineyards as California Winemaker and Oregon Assistant Winemaker and managing four boutique wineries. Previously she worked for Hartford Family Winey and Kendall-Jackson’s Vinwood Cellars. Gran Moraine Pinot Noir Released Jackson Family Wines is now California’s largest landowner in Oregon following the 2013 purchase of the 220-acre vineyard and site of the former Soléna Estate Winery in the Yamhill-Carlton District. The Gran Moraine Vineyard, part of the purchase, is the source of the newly launched Gran Moraine Pinot Noir. Grapes from this vineyard also go into the La Crema Willamette Valley Pinot Noir first released this year. 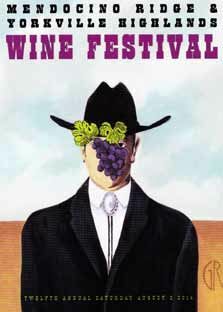 12th Annual Mendocino Ridge & Yorkville Highlands Wine Festival This event will be held on Saturday, August 2, 2014, at Meyer Family Cellars on Highway 128 between Cloverdale and Boonville. Over 60 local wines will be offered along with a grape stomp, highlands games, barbecue, and rare bottle silent auction. For information and tickets, visit www.yorkvillehighlands.org. In Pursuit of Balance 2015 Four new wineries, Big Basin Vineyards, Lutum Wines, Mindego Ridge and Wenzlau Vineyard have joined the 29 returning IPOB wineries. The 2015 events are in New York February 23, San Francisco March 16, Houston March 30 and Japan the week of April 13. IPOB tasting committee, members are Ian Becker, Jon Bonner, Christie Dufault, Ehren Jordan, Rajat Parr and Wolfgang Weber. Visit the website at www.inpursuitofbalance.com. Wally’s Central Coast Wine & Food Celebration Taste nearly 150 of the Central Coast’s finest wines and savor signature dishes provided by renowned restaurants like The Hitching Post’s legendary Santa Maria BBQ, Full of Life Flatbread, and favorite Los Angeles restaurants Republique and WP24. Sunday, July 27, 2014, 1:00-4:00. 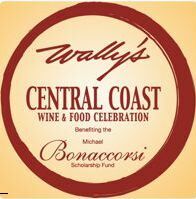 The event benefits the Michael Bonaccorsi Scholarship Fund at Allan Hancock College Department of Viticulture and Enology, whose alumni are the backbone of the Central Coast wine industry. Participating wineries include Alma Rosa, Brewer-Clifton, Fiddlehead Cellars, Foxen, Hilliard Bruce, Melville, Mount Eden Vineyards, Paul Lato, Talbott, and Talley. Tickets are $99 at www.wallywine.com. Santa Rita Hills Wine & Fire 2014 The Sta. Rita Hills Winegrowers Alliance presents their annual Wine and Fire event, a three day adventure exploring the Sta. Rita Hills AVA. Kick Off Barn Party at Sanford Winery’s Sanford and Benedict Barn on August 15 featuring fire-grilled pizzas, music and plenty of Pinot Noir. The Wine and Fire Seminar, The Dirty Truth, will be the following day at Fiddlestix Vineyard where winemakers and sommeliers team up to challenge the senses in a blind tasting of Sta. Rita Hills wines. The morning seminar will be led by Josh Raynolds of Stephen Tanzer’s International Wine Cellar, and features Jeff Newton of Central Coast Vineyard Care who manages hundreds of acres of vineyards in Santa Barbara County. A Hitching Post II catered lunch will follow. Saturday night, August 16, will be the Grand Tasting at La Purisma Mission with local food purveyors and wines from all producers in the Sta. Rita Hills AVA. On Sunday, August 17, members of the Sta. Rita Hills Winegrowers Alliance will hold special open houses. For further information and tickets, visit www.staritahills.com. Urban Winery in Los Angeles Urban wineries are commonplace in Portland, Oregon, New York, New York, and San Francisco, California, but now Abe Schoener, of Scholium Project, plans to seek funding to build a $2 million winery in the Central Avenue district of Los Angeles. Schoener told Decanter.com that he plans to source grapes from the hills east and north of San Diego, the Santa Monica Mountains, and Rancho Cucamonga. He also plans to plant vineyards adjacent the Los Angeles River in central Los Angeles. Currently, Scholium Project releases about 3,000 cases of wine annually from grapes sourced in the Lodi, Napa Valley and Sonoma Coast. Petaluma Gap Applies for AVA Status The Petaluma Gap region, which extends from the San Francisco Bay to the Pacific coast and is currently part of the huge Sonoma Coast AVA, has applied for its own AVA status. The name, Petaluma Gap, is derived from the 15-mile opening in the coastal California hills that allows cool maritime air to enter Sonoma County. It is a distinct winegrowing region, quite different from the western Sonoma Coast and deserving of its own AVA designation. The Wine Dudes Blog Along with fellow wine writer, Eric Anderson (Grape Nutz), I write the Wine Dudes Blog at www.orangecoastmagazine.com. There are two posts a week and a Must-Try Wine of the week. I frequently post on Pinot Noir, but also include recommendations for other varietals. I also post reviews of Orange County restaurant wine programs. Check it out for a quick, interesting read.